Get a funny Caricature Drawing of your Family in a car or any other vehicle in black and white pencils style drawn from your photos. Get an extraordinary Family Caricature which might be presented for Dad's birthday, or as gift on Mother's Day. Anyone of your family members will be surprised by getting such a unique and memorable gift from people who care and love them. 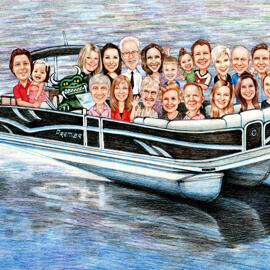 Your Family in Car Caricature Drawing will be delivered as a JPG file by email. You will be able to print your Creative Gift Drawing on any surfaces such as: T-shirt, back-case of a smart-phone, mug, pillow and any other. Make a perfect present for your family as they always dreamed of. We offer additional delivery options at extra cost: Family Trip Caricature Drawing printed on Canvas; Pencil Drawing printed on Photo Paper (Fujifilm Crystal Archive Paper) with different sizes and shapes; Original Pencil Drawing on A4 or A3 size Paper. Note: The vehicle should be paid as an extra character, hence if you are interested in getting 4 persons in a car - purchase 5 characters drawing.